The load can be defined by entering geometry data for a cylindrical gear and a torque. The direction of torque can either be defined by its sign or by the selection “Shaft is driven”/Shaft is driving”. The contact point is given by an angle of contact, which is zero on the y-axis and 90° on the z-axis. The gear is defined by the usual data on a gear drawing: Number of teeth, normal module, normal pressure angle, helix angle with its direction. 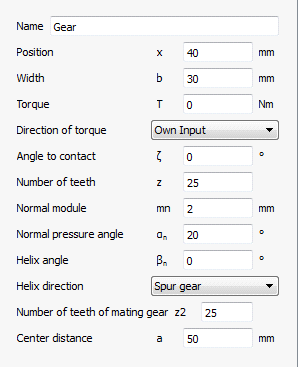 Optional inputs are the number of teeth for the mating gear and the center distance. If they are given, the loads are calculated for the operating center distance, which is more accurate than on the reference diameter. For internal gears the number of teeth has to be entered as negative value, the center distance is always positive as defined in ISO 21771 for gear geometry.